Sunday, July 6th Festival School students arrive. Sunday, July 13th Festival music school students depart. “Filling historical spaces with music brings life to to those spaces: suddenly the walls shatter the musical vibrations into rainbows of acoustic sound for our ears and musical food for our souls.” says festival founder and director Christopher Layer, the New York City based musician and producer who first imagined the week of music, workshops, and art events back in 2011. Layer, whose musical talents will be featured on Broadway this fall in “The Last Ship” a new musical written by the rocker Sting, grew up in The hoosier State and says he started the Indiana festival to share the joy of music after 30 years of playing with symphony orchestras, dance companies, touring with folk and rock bands (including as a sideman for The Waterboys in 2012) and participating in chamber music festivals around the world. 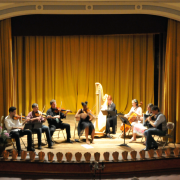 The festival & summer music school are celebrating their third concert season this July 6-12 with a week of acoustic concerts, an art show, a film, a dance and several public “jam sessions” of traditional music. 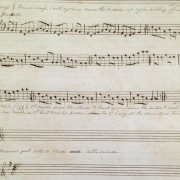 The music ranges from classical chamber music to traditional Irish, Scottish and American old-time music, to improvisation and occasionally some enthusiastic melding of all of those genres. The annual festival was the subject of a 2012 documentary film: Harmonista: Finding Festival shown on PBS television, and also gained some national attention when Fred Child, the host on American Public Media’s Performance Today, hosted the live broadcasts in 2012. A highlight of this year’s festival is an outdoor concert with festival artists and pianist Michael Brown of New York City. The concert is saturday morning, July 12th in side the “Roofless Church”, designed by architect Phillip Johnson and completed in 1959. “We’ll move the grand piano to the apex of the Roofless Church very early in the morning, assemble the players and perform music that was inspired by, or inspired great works of architecture, including The Sunken Cathedral by Claude Debussy, art songs by Leonard Bernstein and Stephen Sondheim, and works for violin and piano by Aaron Copland. Traditional celtic music for harp, fiddle, pipes and flute are also on the bill in the unique “roofless” venue Saturday morning. Layer says that much of his creative inspiration comes from musical polymaths like Yo Yo Ma, Peter Gabriel, Sting, or Leonard Bernstein (whose family foundation and children have lent support to the festival since its genesis) but that some of the deepest inspiration has come from the town of New Harmony, its historic venues, and the townsfolk who volunteer to work for the festival every year. “Given the architectural and historical themes of this years festival, I sought out the help and interest of The National Trust for Historic Preservation, and they responded: Stephanie Meeks, the director of the National Trust in Washington DC will be writing an essay for the program book on the relationships between at, music, and architecture. How we should preserve and utilize our historic spaces in this country.” The town of New Harmony, IN, known as the birthplace of Utopianism, is celebrating its bicentennial this year. Several of the historic buildings are being restored this year as well. One of the featured concert spaces is the Historic Thralls Opera House. The theater is administered by the Indiana State Museum & Historic Sites, and was built in 1824 by the utopian Harmony Society as a dormitory and converted to an opera house and theater in 1859. 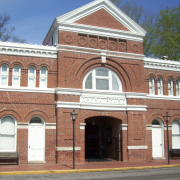 The festival concerts on the 11th and 12th will be broadcast live from the Historic Thralls Opera House on public radio, via a local station, WNIN Public Media, in Evansville, Indiana and will also be available to listeners as a live stream on the world wide web. Friday night’s concert “14-14-14” will feature music spanning the two hundred years of New Harmony’s existence including original Harmonist music from hand-written manuscripts, found in the Working Men’s Institute Library, works from the centennial year 1914, and a new work commissioned by the festival in 2014 for the bicentennial. The festival film this year will be shown on Wednesday, July 9. “This Ain’t No Mouse Music Mouse Music” is Utah filmmaker Chris Simons’ award-winning tribute to the life of Chris Strachwitz, the founder of the roots music label, Arhoolie Records. Both the film and the Wednesday night celtic jam session will take place at Sara’s Harmony Way, the local coffee shop and wine bar on Main Street in downtown New Harmony. The summer music school during the week attracts musicians seeking to broaden their musical horizons in traditional music, chamber music, and improvisation. The students will perform for the festival contra dance at the Rapp-Owen Granary Thursday, July 10, and at a few “pop up” concerts and jam sessions thru the week. “Concert goers can take advantage of the pop-up concerts via last minute push notifications on the festival’s facebook and twitter pages, or by word of mouth, which given the size of New Harmony is likely to be faster than looking down at your cell phone.” said Layer.